Our body clocks are obviously still not on German time because last night we both woke at 3am. Fortunately we managed to go back to sleep fairly quickly but were wide awake again at 6am. It’s still pitch dark still but the town is awake and the traffic on the road is increasing. An 8:12am train to Heidelberg changing at Mannheim saw us arrive in Heidelberg just on 9am. We bought a Heidelberg card which covers all public transport in the city plus entry to the Castle and a ride on the funicular railway up to the castle. Despite the very cloudy weather (thankfully no rain) the view was amazing. 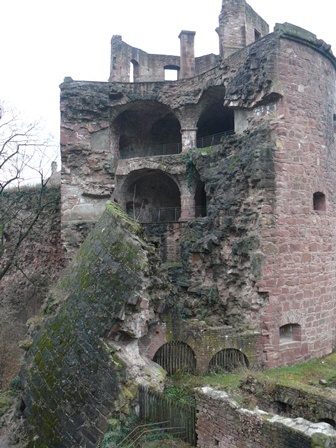 The built between 1400 and 1600, Schloss was partially destroyed by the French in the late 1600’s and had further damage inflicted when it was hit by lightning in the late 1700’s. Some parts are in great condition, other bits are just ruins and much work seems to be going on to stablise some parts. We checked out the Apothecary Museum and the Great Wine cask (holds over 200,000 litres) as well as the gardens above the castle itself. Back down into town for a late lunch and some more wandering around the town. I stumbled on the Kathy Wohlfahrt Christmas Shop and added a little German glass snowman tree decoration to my collection. This is a very famous group of all-year-round Christmas shops and the range of stuff was astonishing, though predominantly in traditional red & green. It starts to get dark about 4pm so we wandered back to the tram/bus interchange and got a bus back to the train station. 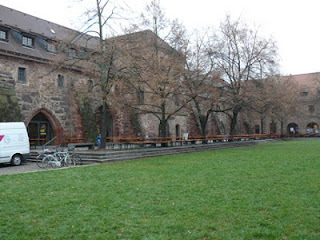 Given that Worms has been un-co-operative in terms of evening meals, we decided to eat in Heidelberg and had a schnitzel at a restaurant next to the railway station before heading back to Worms about 6.30. 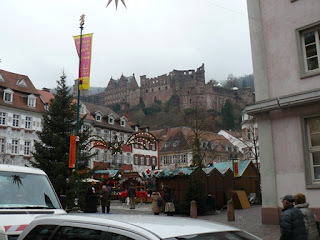 We met up with Lauren at the xmas markets for some gluwein & a bratwurst. I realise now that the quality of gluewin is entirely dependant on the quality of the the red wine used to make it. Sometimes they obviously just use cheap red plonk, because this was probably the worst gluewin I’ve tasted. 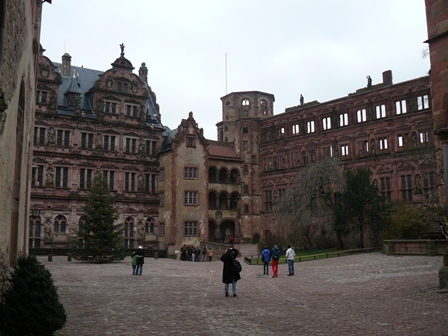 Tomorrow we’re planning on heading to Speyer in the afternoon to have a look round there and a visit to the Xmas markets. Lauren is free after 2pm so we’ll head off then.